Difficulty: Heritage Loop Trail; Easy. Flat, hard packed gravel, stone-dust and narrow paved trail. Dennings Point SP Loop Trail; Moderate. Relatively flat, hard packed dirt trail. Some sections contain tree roots. Mt. bike recommended. Dave Miller Connector Trail/Lower Fishkill Creek Greenway; Easy. Slight hills along a paved & hard packed gravel trail. Lower Fishkill Creek Greenway; Easy. Stone-dust trail. Upper Fishkill Creek Greenway; ? To Start from the Dennings Ave parking lot; From I-84 take exit 11 to Route 9D south and travel 1.3 miles. Turn right on Hudson Ave, then bear right on Dennings Ave. Follow to the parking area next to the sewage treatment plant. 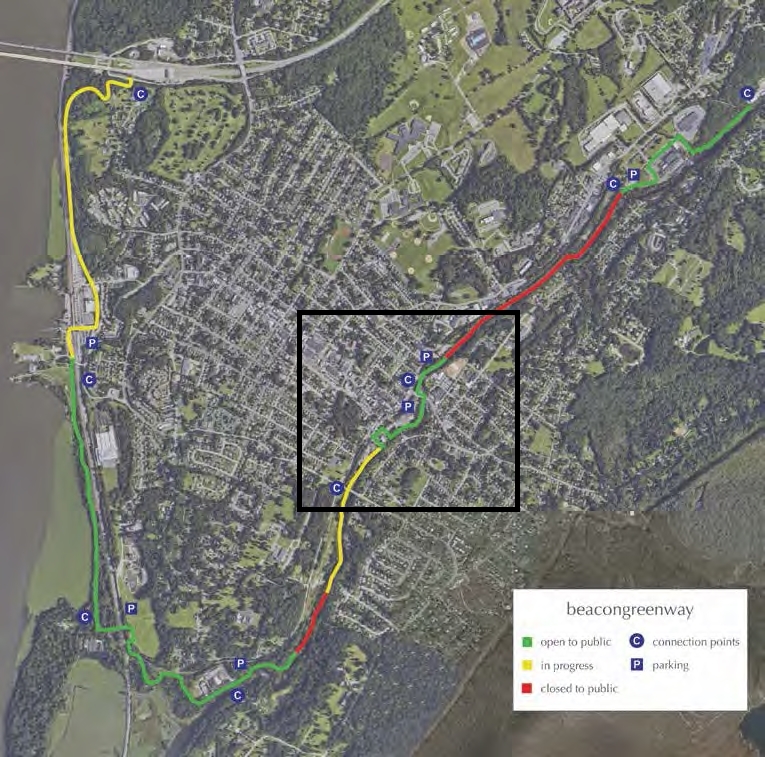 The Fishkill Creek Greenway & Heritage Trail is a planned trail traveling south along the Hudson River from Riverfront Park/Beacon Train Station to the confluence of Fishkill Bay/Creek and Dennings Point State Park. From here the trail will continue east/northeast along Fishkill Creek up to Fishkill. This trail is still a work in progress with gaps along the Fishkill Creek section. Along the Hudson River runs the Heritage Loop Trail [Klara Sauer Trail & Beacon Riverside Trail] between Riverfront Park and Dennings Point State Park where you may connect to the Dennings Point SP Loop Trail. [Note; This trail is closed from Dec 1 -March 31]. Along Fishkill Creek runs the Fishkill Creek Greenway. Bridging the gap between these trails is the short, paved Dave Miller Connector Trail which gets you past two RR crossings. The Hudson Highlands Fjord Trail is a planned 9 mile trail linking Cold Spring's Train Station to the Beacon Train Station. The Heritage Loop Trail [Klara Sauer Trail & Beacon Riverside Trail] are part of this larger trail system. For more information visit; HUDSON HIGHLANDS FJORD TRAIL . Starting from the Dennings Ave parking lot; Travel past the black gate along a wide gravel road and you'll come to an intersection at 0.2 miles. Note; Straight ahead is the Dave Miller Connector Trail which leads to the Fishkill Creek Greenway. SEE BELOW. Heading right you'll cross a bridge over the active RR tracks and then cross a set of inactive RR tracks. This brings you to another intersection at 0.3 miles. Note; Straight ahead is the Dennings Point Loop Trail. SEE BELOW. Heading right along the Heritage Loop Trail, the Klara Sauer Trail consists of a gravel base as it travels alongside the old RR tracks with the Hudson River along your left. After passing by a picnic table tucked under some trees along the river the old RR tracks start to disappear. The trail splits at 1 mile. Left is the Beacon Riverside Trail. Continue straight along the Klara Sauer Trail where the trail opens up as it travels through Long Dock Park. Come to some informational signs and the intersection for the Beacon Riverside Trail. Continue straight along the Klara Sauer Trail as it travels underneath Long Dock Rd and brings you to a parking lot for the METRO NORTH RR . Travel through the parking lot and you'll come to a brick lined path. Right leads to the Beacon RR Station. Head left and you'll come to the NEWBURGH-BEACON FERRY dock. Turn right and travel on-road along Red Flynn Dr (low traffic) just a short distance to Riverfront Park at 1.5 miles. Here, a narrow paved trail loops out along the Hudson River then back to Red Flynn Dr. Retrace your route back to the Klara Sauer Trail, back underneath Long Dock Rd to the informational signs at 2.2 miles. Now turn right along the stone-dust Beacon Riverside Trail. You'll pass by the Long Dock Park parking lot on your right before coming to the kayak pavilion at LONG DOCK PARK . Head left along the dock out to the end where you'll be afforded nice views of Newburgh across the river. To your right is a good view of the Hamilton Fish Newburgh-Beacon Bridge (I-84). Follow the narrow gravel path to your left back along the shoreline, over a boardwalk to an intersection. Continue straight along the stone-dust path to another intersection. Note; Right takes you to a seating area and informational board before ending at the river edge. Continue straight where you'll pick up the wide stone-dust trail. Note; Left brings you back to the kayak pavilion. Continue straight and you'll soon merge with the Klara Sauer Trail at 2.8 miles. Return to the Dennings Point Loop Trail intersection for a 3.4 mile loop. Here I checked out the Dennings Point Loop Trail. Starting from the Dennings Ave parking lot; Travel past the black gate along a wide gravel road and you'll come to an intersection at 0.2 miles. Heading right you'll cross a bridge over the active RR tracks and then cross a set of inactive RR tracks. This brings you to an intersection with the Heritage Loop Trail at 0.3 miles. Re-zeroing mileage. Continue straight to another intersection. Note; Straight will bring you to the BEACON INSTITUTE for RIVERS & ESTUARIES Visitor Center. Restrooms available. Head left along the Dennings Point Loop Trail and you'll come to a map board. Head right along the narrow, hard packed dirt trail into the woods. Quickly come to an intersection and head right up a slight incline. Some rocks and tree roots but very ridable. You travel above the river, which is mostly blocked by the tree cover. After about 0.7 miles the trail loops back alongside Fishkill Bay. This section of trail is less developed with many more tree roots and some muddy sections. You return to the intersection and head right back to the map board. Return to the intersection with the Heritage Loop Trail after a 1.4 mile loop. I then checked out the Dave Miller Connector Trail/ Fishkill Creek Greenway. Starting from the Dennings Ave parking lot; Travel past the black gate along a wide gravel road and you'll come to an intersection at 0.2 miles. Re-zeroing mileage. Head straight past a map board along the paved Dave Miller Connector Trail. The trail travels down alongside an active RR, taking you underneath a RR bridge, then heading up into the woods. Here the hard packed gravel Lower Fishkill Creek Greenway takes you to an overlook of Fishkill Bay at 0.2 miles. Some small hills take you past an intersection on your left to a boardwalk that travels above Fishkill Creek and alongside an old brick building. Cross South Ave into Madam Brett Park parking lot at 0.6 miles where you'll find an informational map board overlooking the creek. A gravel trail continues north alongside the creek bringing you to an overlook of Sucker Falls Dam at 0.7 miles. A gap exists from here northeast to the next completed section as of April 2019. To reach the next completed section follow South Ave from Madam Brett Park parking lot to Tioronda Ave and head right on-road (low traffic). After about 1 mile (I haven't checked out this section yet) the stone-dust Middle Fishkill Creek Greenway picks on your right off Creek Dr? The trail crosses Churchill St before ending at East Main St after approximately 0.3 miles. Another gap exists, as of April 2019, between the final completed section north at Bridge St. Travel right on-road along East main St and across the creek. Turn left on Liberty St (sidewalk available) and follow until you come to Bridge St after 1 mile. Head left back to Fishkill Creek at 1.1 miles. (I haven't checked out this section yet) Cross the Historic cast iron bridge to the Upper Fishkill Creek Greenway as it extends northward, alongside the creek to the parking lot of the self-storage facility at the Beacon Lofts. The second segment is directly contiguous with the first, picking up at the self-storage parking lot and extending up the hydroelectric dam access road. At the top of the dam, the trail connects to the Beacon Gorge, also known to locals as Rocky Glen, with its sheer stone cliffs, which soar high above the deep water held back by the dam. Don't know the distance or trail surface at this time.